Paweł SZYMAŃSKI: Five Pieces for String Quartet (1992); Four Pieces for String Quartet (2013); Two Pieces for String Quartet (1982). Paweł MYKIETYN: String Quartet No. 2 (2006). 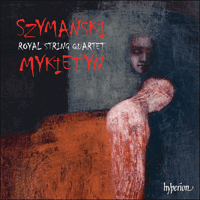 Royal String Quartet: Izabella Szałaj-Zimak, Elwira Przybyłowska (vln), Marek Czech (vla), Michał Pepol (vlc). Hyperion CDA68085 (1 CD) (http://www.hyperion-records.co.uk/). Among the most elusive quartet works imaginable. Alternately harsh or crystalline, with microtones and glissandos among tonal anchors. MAYBE. 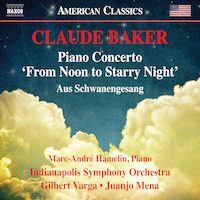 Claude BAKER: Piano Concerto, “From Noon to Starry Night” (2010)1; Aus Schwanengesang (2001)2. Marc-André Hamelin1 (pno), Indianapolis Symphony Orchestra1,2, Gilbert Varga1, Juanjo Mena2 (cond.). Naxos 8.559804 (1 CD) (http://www.naxos.com/). Quotation can be an effective technique, but for it to be meaningful there should be a fundamental style and there’s little of that here. NO. Elfrida ANDRÉE: Piano Trio in G minor (1883-84)1. Laura NETZEL: Cello Sonata in E minor, Op. 66 (1899)2. Valborg AULÍN: String Quartet in F Major, Op. 17, No. 1 (1884)3; String Quartet in E Minor, Op. 17, No. 2 (1889)4. Alice TEGNÉR: Violin Sonata in A minor (1901)5. Amanda RÖNTGEN-MAIER: Violin Sonata in B Minor (1878)6. Bernt Lysell1,5,6 (vln), Ola Karlsson1,2 (vlc), Lucia Negro1,2,5,6 (pno), Tale Quartet3,4: Tale Olsson, Patrik Swedrup (vln), Ingegerd Kierkegaard (vla), Helena Nilsson (vlc). Musica Sveciae MSCD528-29 (2 CDs). 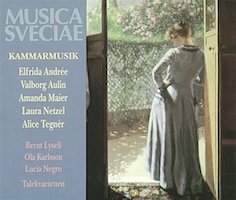 Enthusiastic performances of forgotten Swedish chamber pieces, all by women composers. The two Aulín quartets deserve wider recognition. YES. 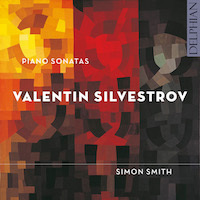 Valentin SILVESTROV: Piano Sonata No. 1 (1972; rev. 1999); Classical Sonata (1963; rev. 1974); Piano Sonata No. 2 (1975; rev. 1999); Children’s Music I (1973); Piano Sonata No. 3 (1979; rev. 1999); Nostalghia (2001). Simon Smith (pno). Delphian DCD34151 (1 CD) (http://delphianrecords.co.uk/). The ironic hints are rushed and the Mozartian touches are taken much too seriously. This is how Silvestrov slips through Smith’s fingers. NO. 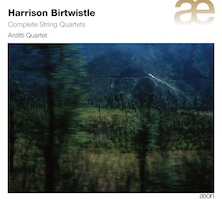 “Complete String Quartets.” Harrison BIRTWISTLE: Tree of Strings (2007); 9 Movements (1991-96). Arditti Quartet: Irvine Arditti, Ashot Sarkissjan (vln), Ralf Ehlers (vla), Lucas Fels (vlc). Aeon AECD1217 (1 CD) (http://www.outhere-music.com/). Surprisingly awkward and ho-hum considering Birtwistle’s proven virtuosity elsewhere. The Arditti’s forthright coarseness doesn’t help. MAYBE. Franz LISZT: Années de pèlerinage: Deuxième année: Italie (excerpts) (1846-49); Années de pèlerinage: Deuxième année, Supplément: Gondoliera (1859); Deux Légendes (1863). Wilhelm Kempff (pno). Deutsche Grammophon DG 00289 477 9374 (1 CD) (http://www.deutschegrammophon.com/). 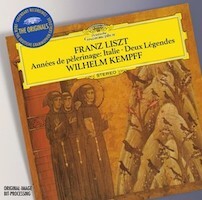 Various pressings exist of the 79-year-old Kempff’s ravishing Liszt, perfectly equalized between showmanship and monastic contemplation. YES.